I have written few posts on ASP.NET 4.5 and Visual Studio 11 that . All the post featured as Article of the day at Microsoft official website http://www.asp.net/community. I mainly focused Web development. If you want to learn about new version of ASP.NET 4.5 and Visual Studio 11(Now Visual Studio 2012). This post is part 1 of 2 series on Strongly Typed data controls and Model Binding in ASP.NET 4.5. In this post, I discussed about Strongly typed data control, Model Binding, filtering data, Value Providers and about writing own Custom value provider. This is second and last of on the series of Strongly Typed data controls and Model Binding in ASP.NET. In this post I discussed the editing feature and custom validation attributes. In this article, we discussed the support of Unobtrusive validation in ASP.NET 4.5. This reduces the rendered page size dramatically. Instead using java-script function and other client side libraries. It uses HTML5 data-* attributes for all these validation. In this post, we discussed the Request Validation enhancement made in ASP.NET 4.5. There are several times nowadays, we require to allow the user to script tag as Input. This is the backbone of many blog site. But if proper validation is in place then “A potentially dangerous request..”. 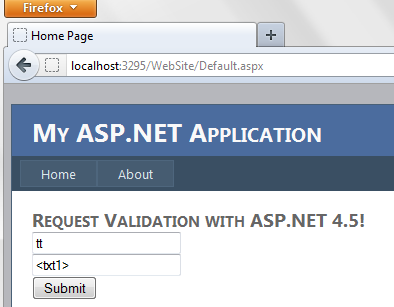 Now ASP.NET 4.5 allows to partial unvalidated request to be submitted.I also discussed Lazy/Differed validation.. In this post, I discussed the enhance made in .NET 4.5 and ASP.NET 4.5 which allows you to write Asynchronous modules in very simple steps in the way you write the synchronous way. 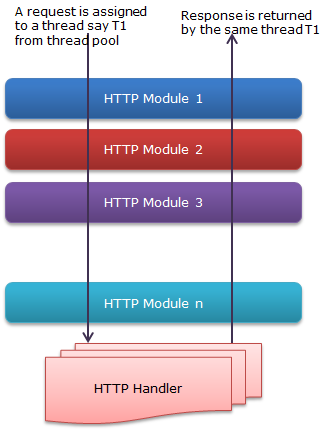 Asynchronous modules can be come a boon at certain situations for your Application performance..
As in Asynchronous HTTPModules, Asynchronous HTTPHandlers can be written very easily with the version ASP.NET 4.5. It also can be a boos t for application performance.. This is one of the best things I like in Visual Studio 11. Page Inspector is integrated with VS 11 and provides the capabilities of web development tools and apart from this directly navigates you to the corresponding aspx/ascx/master… files also. 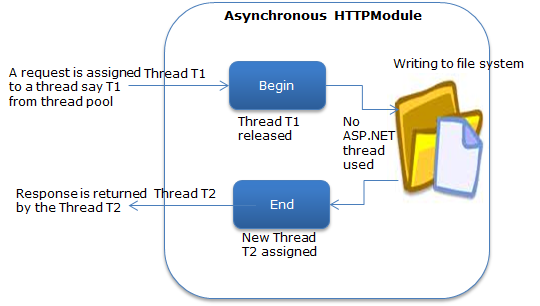 In my last post, I discussed about writing Asynchronous HTTPModule with ASP.NET 4.5. You can check the link Below. In last post, I also briefly discussed about the enhancement made in .NET 4.0 and .NET 4.5, that made our life very easy to write asynchronous code. And in ASP.NET 4.5, we can use these features easily. As we know if we need to create a normal custom HTTPHandler. We need to implement IHTTPHandler interface and if we want to create a custom Asynchronous HTTPHandler, we need to implement IHttpAsyncHandler. In this post, I will be discussing, How we can write Asynchronous HTTPHandlers with the help of new features introduced in .NET 4.5 framework. 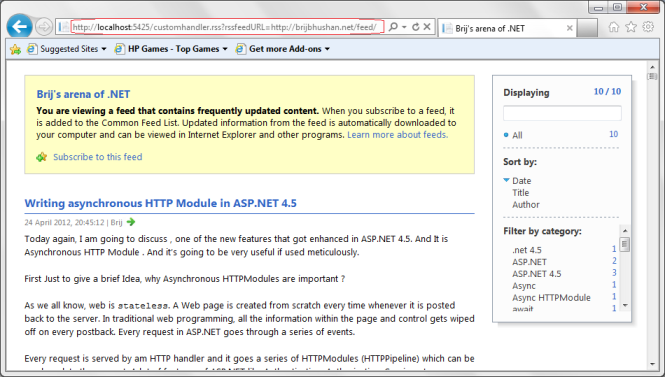 In the example, I’ll create an asynchronous HTTPHandler with the help of asp.net 4.5 that downloads rss feed. To create Asynchronous HTTPHandler in asp.net 4.5, we need to implement the method ProcessRequestAsync of new abstract class HttpTaskAsyncHandler that got newly introduced. For that I created a class library named AsyncHandlerLibrary , which has a Handler class CustomAsyncHandler which implements HttpTaskAsyncHandler. Now if you see the above code, I have implemented ProcessRequestAsync , in which I read the rss url from query string. And asynchronously downloaded the rss feed and later wrote it in response. Now you can see, with help of new keywords async keyword and await operator of .NET 4.5, it is extremely easy to write asynchronous code. 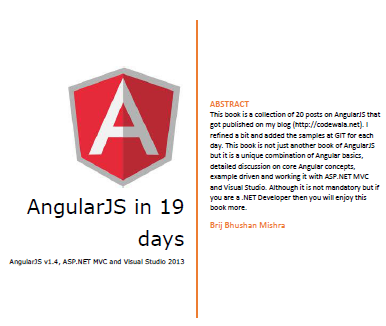 It also got ensured that same can be used in asp.net with the introduction of new APIs. Hope you all have enjoyed the above post. Security is always the one of the greatest concerns of Applications and when it comes to web applications, they are more prone to security breach. All the web technologies provides many features that are used to write secured web applications. Here In this post, I am going to discuss Request Validation feature, mainly focusing ASP.NET 4.5 version. This helps to avoid script injection attacks. So it is always recommended to validate all the data that is passed from client to server because it can be malicious code and can be harmful the application. Although, if we are sure that this situation would not arise, it can be disabled at application level or page level so no request will get validated. But this is not the case every time. On some occasions, we may need to allow users to enter some html, xml etc.. data . In this case, we need to partially validate the request. Till ASP.NET 4.0, we have option to disable the request validation in the entire application or can be done page by page. But till now we did not have option to partially validate the page. ASP.NET 4.5 enables us to validate some specific part of the request. ASP.NET 4.5 provides us two features. I have created a sample application and have two textboxes – txtValidate and txtunValidate, with a submit button. Now Let’s run the code. And as you can see I’ve put some script tag in txtunValidate and it worked fine. 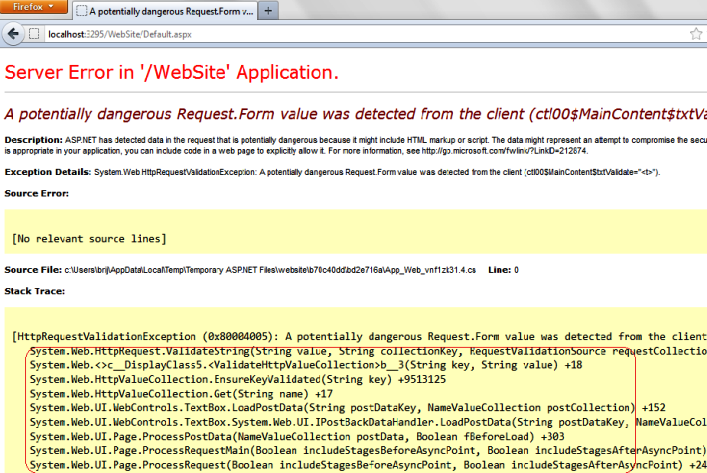 But let us remove the requestValidationMode from web.config and try to submit the same input again. 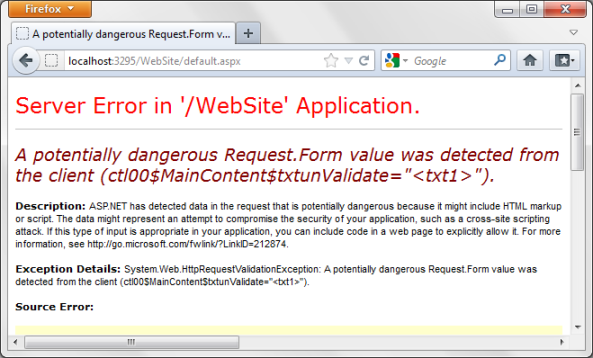 and see it gave the HttpRequestValidationException exception and got the above screen. Now lets again put the attribute requestValidationMode in web.config and try to put some script in txtValidate and submit. It’ll show you the same exception again as expected. So here you can see, ASP.NET 4.5 enables us to selectively validate the request. This is also introduced in asp.net 4.5 and I’ll say that above feature is just a corollary of this feature. To provide these features, Microsoft has done some major changes in the way Request Validation feature got implemented in earlier version of ASP.NET. 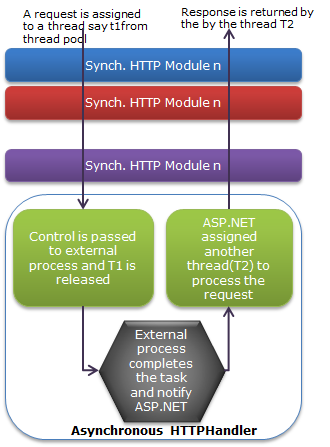 As we know, to process a request, ASP.NET creates an instance of HTTPContext which holds the instance of HTTPRequest and HTTPResponse with other required data. All the input data that is passed from client to server, it is posted in form collection, querystring etc.. ASP.NET validates every data that is passed from client to server. Now the same data is available at two places. 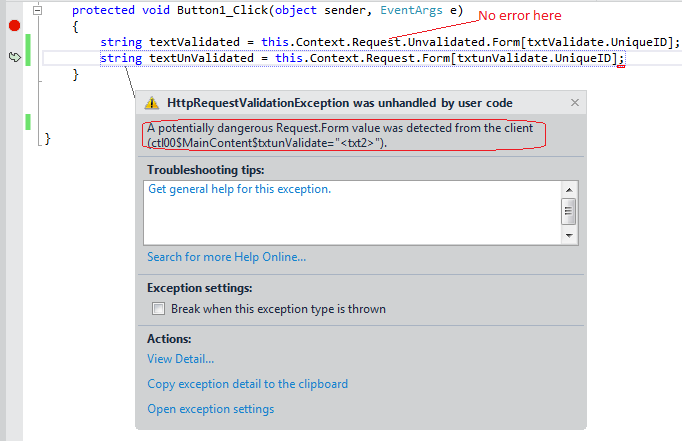 In UnValidated collection and normal in HTTPRequest. When we set the ValidateRequestMode is disabled, the data is accessed from UnValidated collection else normal request. UnValidated collection don’t trigger any validation while other one triggers. I’ll show you a demo later. In earlier version of ASP.NET 1.1/2.0/3.5, Request validation is done at earlier level of page processing. There were also some good amount of changes took place in ASP.NET 4.0, which provides us the feature to validate the non-ASP.NET resources as well which was not available earlier. But if we examine the circled part of the stacktrace, we can easily Identify that in 4.5, the validation exception got thrown from TextBox’s LoadPostData method. Let’s do some experiment to examine this. I have made two case studies for this. 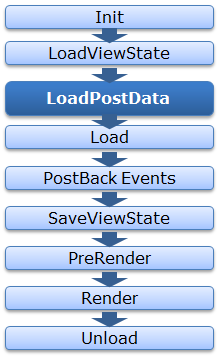 As you can see, here LoadPostData is a part of PageLife Cycle and comes after LoadViewState. All of the Input control’s data don’t get wiped off during postback even if viewstate is not enabled for that control. I have written a post on it. You can view this here. So this is the LoadPostData method that is responsible to get the data from Form collection and assign it to the control. 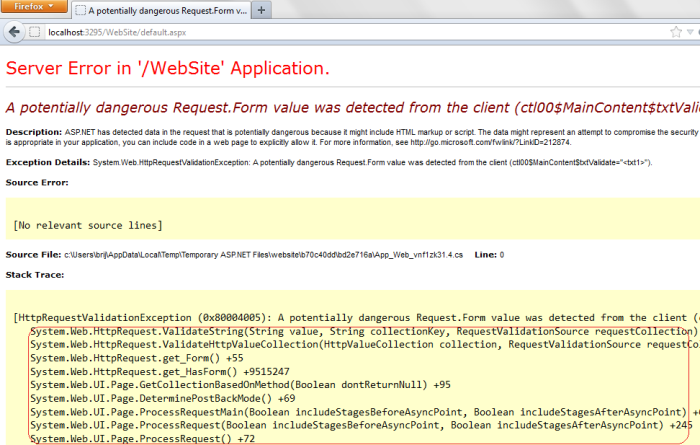 As I said, Now asp.net 4.5, validates the input only when you access the data from form collection. That’s why if you look the stacktrace then it is visible that the exception is thrown from LoadPostData method only and page life cycle is the last stage of ASP.NET Request Processing. Now set the requestValidationMode as 4.5 in web.config and enter some script tag and submit. You would not get any error even RequestValidation is enabled. This proves the validation fires only when data is accessed from the form collection. Here I’ll also try to prove the same as above. I have already shown above that How the new UnValidated property of Context holds all the data including form collection, querystring, cookies etc. So whenever the data is accessed from the UnValidated collection, the validation is not fired. But when it is accessed from the normal form collection, validation gets fired. Oh!! see even we have disabled the validation, even in that situation when data is accessed from normal Form collection the validation is fired. This again proves the validation is fired only when the data is acessed and when the ValidateRequestMode is set as disabled it is accessed from the UnValidated property. Hope you all have enjoyed the post. Do share your precious feedback.